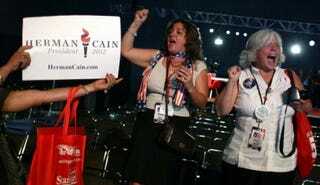 Can Herman Cain win the 2012 Republican presidential primary? Probably not. But it's mighty interesting that he just beat so-called front-runners Rick Perry and Mitt Romney in today's Florida straw poll. Perry had been expected to win, but perhaps Florida's Republican voters like Cain's proposed "9-9-9 Plan" (oooh, don't turn that one upside down), which would tax businesses, personal income and retail sales all at 9 percent. Or maybe they're just not all that impressed with Texas swagger. In other news: Possible Government Shutdown Looms.